Marysville Blazing Onion is located in the outdoor shopping center, Marysville Gateway Plaza. Gateway is across I-5 from the Tulalip Casino and Seattle Premium Outlets. It is anchored by Winco Foods and major retailers Kohl’s, Ross, Pet Smart and Party City. Come explore this unique and beautiful place and then stop by Blazing Onion for a great gourmet burger, salad or dessert! Our menu features over 25 unique gourmet burgers including a meatloaf burger, a buffalo burger and a wild boar burger. Do you have a favorite burger combination, it’s probably on the menu. We insist on high-quality ingredients such as Tillamook cheese, thick-cut peppered bacon, homemade burger sauces, locally baked buns, fresh produce and ALL Natural ground chuck. For a healthier option substitute our ground chuck for a fresh chicken breast, our house made turkey patty or our house made farmhouse vegetarian patty. We press each burger patty in house from fresh-never frozen, ALL Natural (meaning – no anti-biotics, no hormones, vegetarian fed), 100% ground chuck from Painted Hills. It’s literally a mouth full. We top each of our gourmet burgers with our own top secret signature burger seasoning and serve them on locally baked buns that don’t fall apart when confronted with lots of juicy sauces. Of course we’re not just about great burgers, check out the full menu. Conveniently located across the freeway from the Seattle Premium Outlet Malls, Cabela's and Tulalip Casino, Marysville Gateway Plaza offers shopping, dining and more. From the parking lot, you can easily jump onto northbound I-5 or continue over the freeway and sneak into the outlet malls from the north. 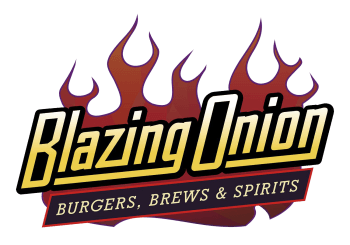 There's always something fun happening at Blazing Onion. Whether its Brewer's Night, Ladies Night, the big game or something else, like us on Facebook or follow us on Twitter to stay up to date with the latest events and promotions. We have lots of fun at Blazing Onion in Marysville! Take a look at our photo gallery for a peek inside. “So glad you brought Blazing Onion to Marysville.